Happy Friday friends!! I’m so excited for tonight. One of my gal pals and I are headed to the Pink concert. I am a fan of her music, and I have heard she puts on a great show. It’s definitely going to be a fun night out. I’m already receiving invites for a few Kentucky Derby parties next weekend. Not going to lie, I have little interest in the race, but I do love an excuse to wear a pretty dress and fancy hat. For those of you wanting something different, I wanted to share a Kentucky Derby outfit idea that is not a dress. 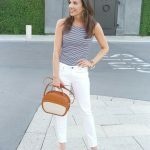 Because it’s Spring and most will be wearing colorful dresses, I knew white jeans needed to be involved. 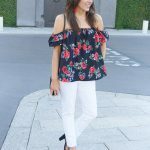 White jeans are an easy way to make any outfit look dressier. 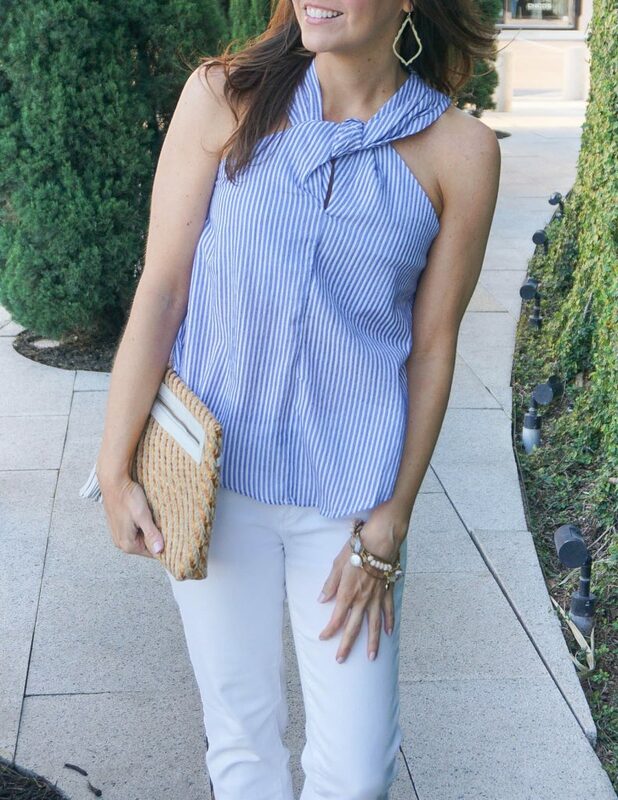 This blue and white striped halter top is perfect for a Kentucky Derby party. The design of the halter and almost seer sucker type material dresses up this outfit a little. Both pieces will help you blend in perfectly with all the dresses. Floral prints and gingham tops would also work or anything with a fun spring color to contrast with the white. 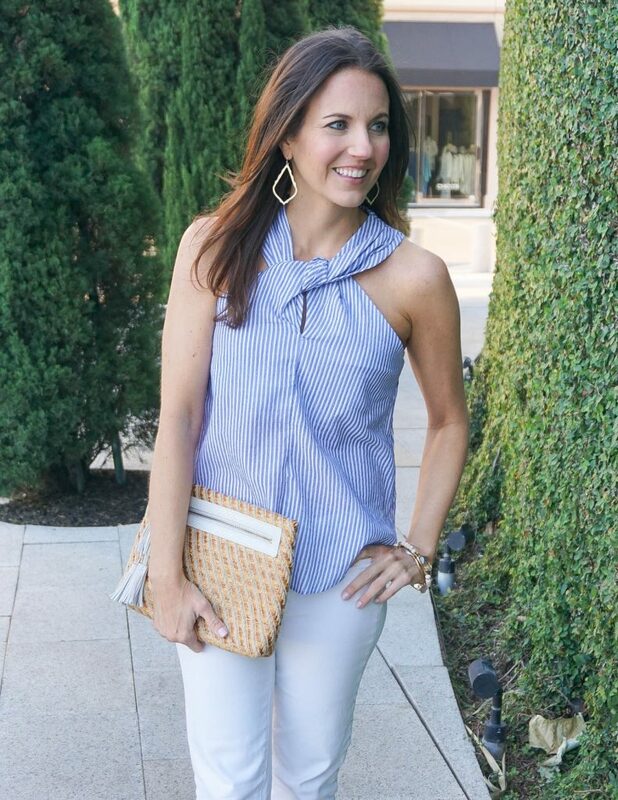 Even if you are not heading to a Kentucky Derby party, this outfit would be a perfect dressy casual jeans outfit for any summer parties you have coming up or just for brunch with friends. I’m wearing an XS in the top. Overall the fit is perfect, but it is slightly snug in the bust department. You might want to size up if you are a little more gifted in this area than me. Thanks for stopping by this week! I hope you all have a fabulous weekend! 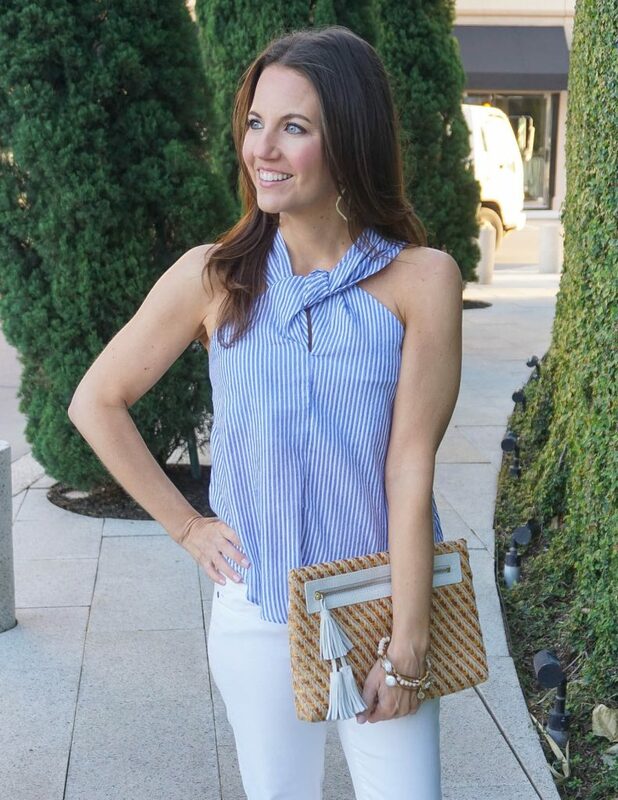 Great outfit with a beautiful striped top and the bag is very nice as well! Have fun tonight! What an adorable outfit! That top is super cute!